The next piece of our Born this way series is by Vica. Read the others' stories as well and find the series summary HERE. 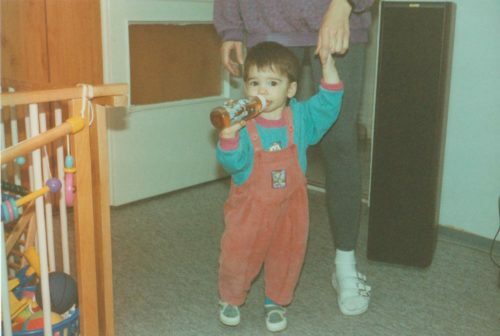 In this picture I’m about 2 years old, and my mom is holding my hand, while I am sipping from my bottle recklessly. Looking back I’m quite envious of myself for having such a cool pair of dungarees, I would probably still wear them. My mother has always been close to me, so I’d like to write about my relationship with her. As a kid, I was very dramatic and very social. I got along with everyone, but my biggest idol has always been my brother, who is 6 years older than me. I imitated whatever he did at any possible moment, and it felt like an honor to wear his hand-me-downs. I avoided anything too “girly”, knowing that my brother would definitely not think of them as cool clothes. And then puberty came, and things got weirdly difficult, if I looked too boyish I got called a lesbian, and if I were “presentable” to others, I ended up feeling ridiculously uncomfortable. Everything was confusing, until I was 14 years old and I realized I was in love with my best friend, who is a girl (what a cliché!). The most difficult thing was to admit it to myself, I spent months locking my door, picturing every possibility of talking about this to anyone. “But, I can’t be…” “This can’t be my life…” “This is not right!” All I heard about gay people all my life was that they are disgusting, ridiculous and stupid. At some point, I couldn’t deny it anymore: I saw my best friend as a princess who was locked up in a tower, and I wanted to be the one to save her on a white horse. So I gathered all my courage and decided to tell my mother the biggest secret: that I like girls the way I’m supposed to like boys. Her first reaction was “so that’s why you’ve always been so strange”. We cried on each others’ shoulders that night, but the next day she was acting like nothing ever happened. A few months later we got into a fight because I cracked a joke about my sexual orientation in front of my friends, and she told me that she won’t defend me if I ever get hurt because of this, and that instead of talking about it I should just go see a doctor. I got the memo, and I didn’t talk to her about me being gay or that the gossip started spreading at school and people were talking about me behind my back, people I didn’t even know. I slowly accepted that this was my fight alone and I couldn’t rely on anyone’s help, especially my mom’s. Years passed, and I couldn’t start a decent conversation with her, because I was mad at her, and she had no idea what to do about it. I’ve had other problems, too, which caused me to start seeing a therapist. But it didn’t help. Not the first, not the second and not the third one. But the fourth therapist was different, I met her 6 years after my coming out. I could talk to her honestly about anything, and it felt like somebody was fully supporting me for the first time. I’ve got her to thank for so many things, even finding qLit. She spoke to my mom maybe twice, and it changed our situation in a way I never even hoped it would. My mom took the first step towards me, she brought it up after 6 years of not talking about it, and she admitted that it was difficult for her to accept me being gay because she feared for me. I didn’t see disgust on her face anymore, I saw curiosity. At first, she was hoping it would pass, but she could finally see that I wasn’t gonna change, and she didn’t see that as a problem anymore. She even said the magic words: “I only want what’s best for you, and I want you to be happy”. Many people are surprised by the fact that I came out when I was 14. I still think it was one of the best things I’ve ever done, and I’m glad that I fought my fear of it so soon. I think everyone feels when the time is right to take this step. I know that it’s scary, because you can never return to your previous “safe” state. But you don’t have to. It’s much better here, outside of the metaphorical closet.